Stock photo of woman iceberg watching from the shore in the town of Quirpon with pack ice in the harbour, Trails to the Vikings, Viking Trail, Great Northern Peninsula, Northern Peninsula, Newfoundland, Canada. Model Released. Woman watching the pack ice in the harbour along Trails to the Vikings, near town of Quirpon. 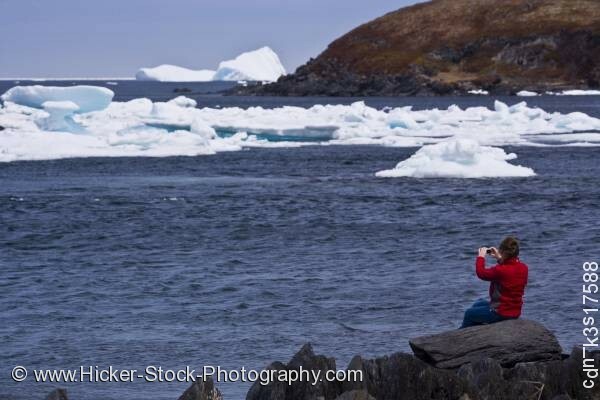 This stock photo shows a woman is iceberg watching from the rocky shoreline in the town of Quirpon with pack ice in the harbour, Trails to the Vikings, Viking Trail, Great Northern Peninsula, Northern Peninsula, Newfoundland, Canada. Model Released. Along the harbour’s rocky shoreline near the town of Quirpon, a woman watches the packed ice floating in the deep blue waters of the bay. The woman photographs several large chunks of ice as they float in the bay and around the peninsula. Larger ice chunks can be seen further in the background in more open waters just beyond the peninsula’s hillside.